Waterfalls make up some of the most visited and best known natural tourist attractions around the world. Stunningly beautiful, it’s little wonder that people travel from far and wide to enjoy the breathtaking natural attractions that are world renowned for their magnificence. Situated in Ontario, Canada and New York, USA, Niagara Falls is undoubtedly the world’s most famous waterfall. At 51 metres in height, it is certainly not the tallest. However, this magnificent waterfall has an average flow rate of 1,834 cubic metres per second. Connecting Lake Erie and Lake Ontario, this three-part waterfall attracts around 12 million visitors every year. Niagara Falls can be enjoyed by boat, helicopter or on foot. 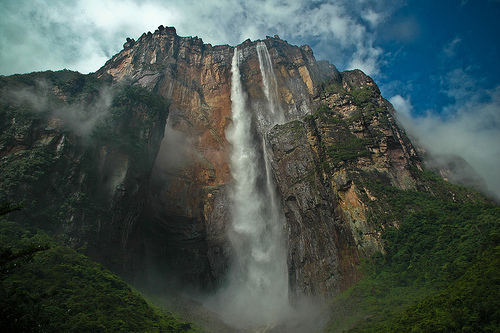 Located in Venezuela’s Canaima National Park, Angel Falls, otherwise known as Kerepakupai Merú, is the world’s tallest and some would argue most beautiful waterfall at 979 metres. Around one million people are thought to visit the waterfall each year. The best ways to explore Angel Falls, which ought not to be confused with the three North American waterfalls of the same name, are from the top or at the very bottom. 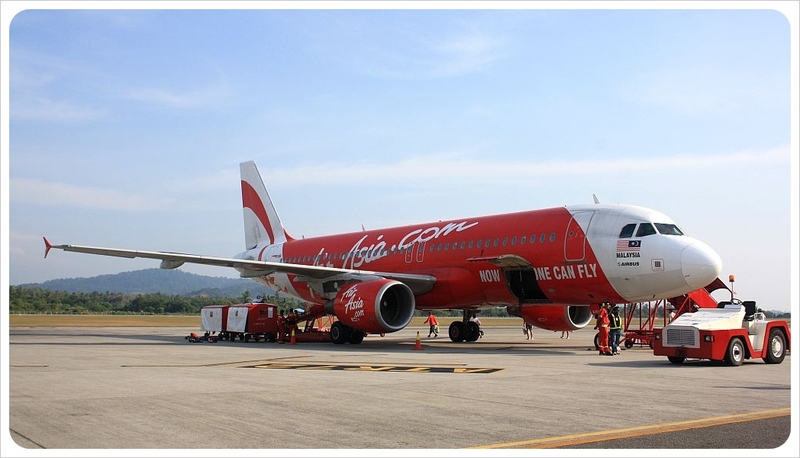 However this UNESCO World Heritage Site is enjoyed, it is guaranteed to impress. A truly outstanding natural spectacle. At 82 metres, Iguazu Falls is much shorter than many of the world’s tallest waterfalls, but what it lacks in height it makes up for in volume, especially during the rainy season, when the Rio Iguazu can swell up to eight times its usual size. Forming a natural boundary between Argentina and Brazil, Iguazu Falls has an average flow rate of 1,756 cubic metres per second, which is almost the same as Niagara Falls. 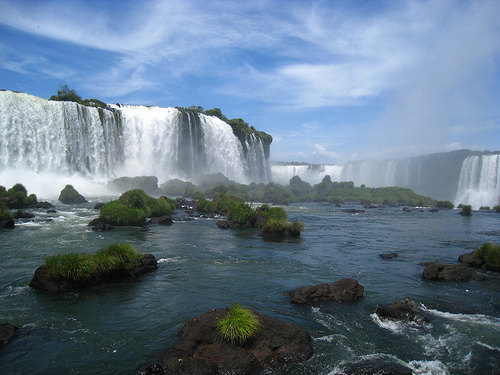 Hundreds of thousands of tourists visit Iguazu Falls every year. Known among locals as “Mosi-oa-Tunya”, this stunning African waterfall is neither the tallest nor most voluminous waterfall in the world, but aside from being among the most spectacular, it is widely regarded as the largest. 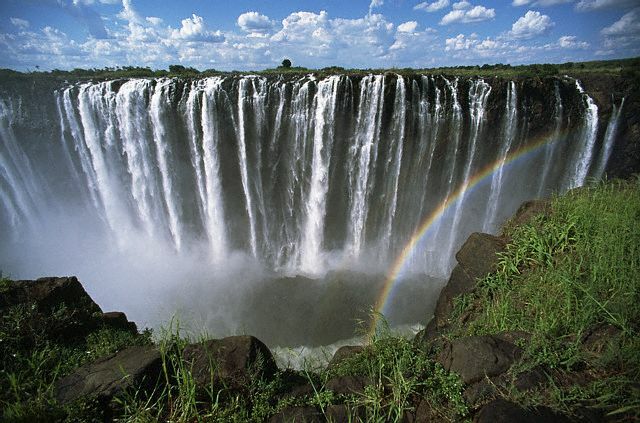 Measuring 1,708 metres across and boasting an average flow rate of 1,088 cubic metres per second, Victoria Falls is so vast and impressive that rainbows often form in its spray. Comprising four main channels (Devils Cataract, Main Falls, Rainbow Falls and Eastern Cataract) and flowing into the Zambezi River, Victoria Falls is visited by approximately 2.5 million tourists every year. Many people head to Zimbabwe for safari holidays but if you are planning a trip to the country, be sure to include Victoria Falls on your holiday itinerary! Situated on the gorgeous Hawaiian island of Molokai, Olo’upena Falls (sometimes referred to as Oloupena Falls) is the fourth highest waterfall in the world behind Angel Falls, Tugela Falls (South Africa) and Cataratas las Tres Hermanas (Peru). 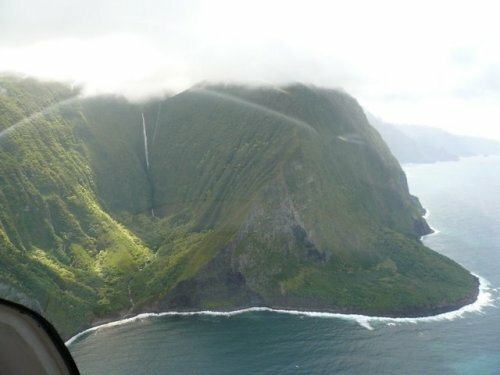 At 900 metres, Olo’upena Falls certainly provides some stunning views of the surrounding cliffs and ocean. Olo’upena Falls does not attract the same number of visitors as Niagara Falls or Victoria Falls, but it is almost as impressive in size and beauty. The waterfall does not boast an especially high flow rate or water density, but its relatively gentle trickle can be enjoyed by land, sea or air (helicopter). Street Art special: Oh Canada! Breathtaking, I hope some time soon i will be at Olo’upena Falls. Width is also important. I have been to Niagara and Iguazu, and Iguazu are much, much, much more impresive. Not only are they 50% taller than Niagara, but also they’re three times as wide. Niagara gets more press, however. Niagara’s greater press footprint might have something to do with the twenty or so times as many people who live within a short drive, as well as its being near a major transport hub and a traditional honeymoon spot, It also connects two very stable countries, whereas Iguaçu’s neighbors’ history has been discouraging to travelers at times. Niagara Falls is among the world’s ten most visited tourist destinations, equaling Iguaçu’s yearly total in a good summer’s week. Don’t forget, too, that Sugarloaf and Corcovado in Rio get a lot more press than similar peaks in Los Angeles and Seoul.